One thing that I have noticed is that there is not a publicly available concise document that explains basic Final Jeopardy! betting strategy. The following document was written by me in 2011 for a friend who was going to be on the show. She did not win, but she did play very well and was only felled by a very difficult Final Jeopardy. It has since been updated for the 2014 rule change (namely, that ties are broken by a tiebreaker) and used by a couple of other contestants; one of them received news coverage for “one of the craftiest moves in show history”. So, without further ado, here is Wagering Strategy 101: How To Bet in Final Jeopardy! Congratulations! If you’re reading this, you’ve probably received The Call to be on Jeopardy! and need some sort of pointers on knowing how to avoid major wagering mistakes on the show. This guide will go over the basic Final Jeopardy! betting strategies. The contestant co-ordinators do provide writing instruments and paper to write on when attempting to determine wagers. My advice would be to practice writing with Sharpies on index cards, if you can find them. Be advised that there are more advanced strategies than the ones covered here; however, many of them range from the theoretic to the experimental and lack enough significant data. The one general principle used in the majority of wagering strategies for the show: When leading, it is significantly better to lose by getting Final Jeopardy! incorrect than it is to lose by getting Final Jeopardy! correct and be overtaken by a trailing player. Generally, this means to make a wager that will defeat the trailing player by at least $1 if both players get the question right and the trailing player bets everything (henceforth known as a cover bet). Under this principle, if a leader follows this strategy, a correct response to Final Jeopardy! renders everything else moot. Conversely, when trailing, one need only focus on circumstances for when the leading player misses Final Jeopardy!. Between 2004 and 2011 when this original guide was written, a leader failed to make the cover bet only 12.5% of the time. Example game: Leader $18,700 Second $12,400 Third $1,600. Determine the leader’s optimum cover bet over 2nd by doubling second place’s score, adding $1, and subtracting the leader’s current score. (12400 * 2 = 24800; 24801 – 18700 = 6101). Now, see what happens if the leader’s wrong (subtract the cover bet from their score). 18700 – 6101 = 12599 Second and third should take note of this and attempt to ensure their score gets (or stays) above this number. As you can see here, 3rd place is out of contention in this scenario (1600 * 2 = 3200). 3rd place should therefore make a bet based on what 1st and 2nd place’s scores would be if 1st and 2nd are incorrect. Lock Game – 2nd place’s score is less than 50% of the leader’s score (Example: Leader has $13,000, second place has $6,000). Lock-Tie Game – 2nd place’s score is exactly 50% of the leader’s score (Example: Leader has $13,000, second place has $6,500). Crush Game – 2nd place’s score is between one-half and two-thirds of the leader’s score (Example: Leader has $13,000, second place has $8,000). 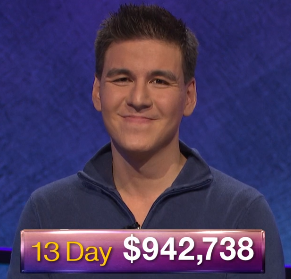 Two-Thirds Game – 2nd place’s score is between two-thirds and three-quarters of the leader’s score (Example: Leader has $13,000, second place has $9,000). Three-Quarters Game – 2nd place’s score is at worst, three-quarters of the leader’s score. (Example: Leader has $13,000, second place has $10,000). Being in the lead going into Final Jeopardy! means that you’ve got the most control of your destiny. In all of these scenarios, the most important numbers are your score, and double second place’s score. In these examples, I will refrain from giving 3rd place’s score unless it is necessary to the situation. Congratulations! Barring a rather serious mistake that this primer looks to avoid, you have the game won! Don’t be tempted by the category to risk more than you have to here. Example game: You have $13,000, second $6,000. Double second place’s score. 6000 * 2 = 12000. Therefore, your bet should leave you with no more than $12,001 if you get Final Jeopardy! wrong. In fact, any wager between $0 and 13000 – 12001 = $999 is acceptable. In this case, you are technically betting money you’ve won, so anything within your comfort level here is quite acceptable and defensible. This used to be a very easy scenario. However, in November 2014, the show changed its rules; a tie at the end of Final Jeopardy! is broken with a tie-breaker clue. Example game: You have $18,000, second $9,000. If you think you have a better chance of winning a random tiebreaker than a clue in the category you’ve just seen, bet $0. Otherwise, bet $1. Here’s why. Not quite as good as a lock game, but you’re still in a strong position here. With the cover bet, the only way to lose if you miss Final Jeopardy! and the trailing player gets it correct. Example game: You have $17,000, second $9,000, third $7,200. Double second place’s score. 9000 * 2 = 18000. The standard cover bet here is 18001 – 17000 = $1,001. (Note: If you’re feeling aggressive, it is safe to bet more than the standard cover bet here, as long as you first stay above both double third place’s pre-Final Jeopardy! score (in this case, 7200 * 2 = 14400) and second place’s pre-Final Jeopardy! score (9000), due to your strong position). Here, the games are much closer. Don’t be afraid to have faith in your own abilities, no matter how daunting the category looks. Remember, you’re smart enough to appear on the show. Example game: You have $16,000, second $13,000 third $9,000. The standard cover bet here, therefore is 26001 – 16000 = $10,001. Remember to have faith in your abilities once you hear Final Jeopardy! Your two defensible choices in a tie game: bet everything and hope you get the question right; bet nothing and hope that your opponent gets the question wrong. If 3rd place is still in contention, though, as in the above example, you should really be betting everything to ensure that third place don’t pass you. Remember, you’re smart enough to get on the show and to be tied for the lead going into Final Jeopardy. Have faith in your abilities! Here, because you both have 3rd place locked out, $0 becomes a defensible wager. If you feel comfortable with the category, I’d recommend betting everything; if you don’t, bet $0. If you feel that you can, figure out what your score will be if you’re wrong. Do the same for second place; figure out what their optimum cover wager is over third, and what will happen if they are right/wrong. If you find that your score on a wrong answer is $1 less than one of the current scores of your opponents, give serious thought to betting $1 less and risking the possibility of a tie game. Unfortunately, unless the leader makes a grave error, you pretty much have no hope of winning. Make the optimum cover bet over 3rd place here, and hope to take 2nd. Check to be sure you’re not in contention; doubling your score give $12,000, less than the leader’s $13,000. Doubling third place give 4600 * 2 = 9200. The cover bet is 9201 – 6000 = $3,201. If your score is exactly 50% of the leader’s score, most leaders will bet either $0 or $1 here at this point. You should, therefore, bet everything and hope for a correct answer on Final. With optimal wagering from the leader here, your only chance is for the leader to miss Final and you to get Final correct. Therefore, you might as well bet as much as you can in order to maximize your winnings in case this happens. Your minimum good wager here is $1 more than the difference between your score and the leader’s. Here’s where it gets fun, and where strategy can turn a loss into a win. Calculate first off what the leader’s bet is if they bet to win by $1. In this case, the leader’s rational cover bet is 11400 * 2 = 22800; 22801 – 16000 = $6,801. Now, figure out what will happen if the leader misses Final. 16000 – 6801 = $9,199. You have to make sure that your score does not fall below $9,200. In this specific situation, it’s advantageous to bet up to only $1,399, as that bet keeps third place from catching you as well. Any bet between $0 and $1,399 will work, depending on your comfort level with the category. One caveat: Note that this bet will not be able to pass the leader’s score as the score is between two-thirds and three-quarters; the leader can defend against this, but it is such a rare occurrence that it is not currently worth defending against. If you’re stuck in a situation where you can’t both cover third place behind you and stay above the leader’s score, you’re in what is regarded as Stratton’s Dilemma (named after Ted Stratton who first posed the problem after dealing with it in his first game in 2005. The general consensus on how to handle Stratton’s Dilemma is to bite the bullet, make the bet to cover 3rd place, and realize that the leader is in a better position because you and third place are so close to each other in score. The three-quarters game is very similar to the two-thirds game, except that you’re close enough to safely make a bet that both passes the leader’s Final Jeopardy! score and still stays above their total. In this case, your minimum bet raises from the $0 in the two-thirds-game scenario to $1 more than the difference between the two scores. Calculate first off what the leader’s bet is if they bet to win by $1. In this case, the leader’s rational cover bet is 12400 * 2 = 24800; 24801 – 16000 = $8,801. Your minimum bet should get you to at least $16,001 if you are correct; therefore, it is 16001 – 12400 = $3,601. Your maximum bet should be 12400 – 7200 = 5200. If you have the opportunity, watch how the players before you have played. If the leader has shown a lack of wagering strategy knowledge that led to a previous failure to cover, then you can safely ignore everything above and wager everything, hoping to capitalize on another mistake by the leader. Additionally, if you have the opportunity, run through the leader’s and third place’s best options; it may reveal that a single, specific bet is your best one. So you’ve had a rougher day on the show and find yourself in third place. You can still win the game with a shrewd wager though, in most cases, or a lucky Final. Don’t count yourself out yet, and remember that $0 is never a winning score! Am I Still In Contention? Your score needs to be greater than 50% of second place’s score. If both of the above are true, you’re still in contention. If not, you’re going to need one or both of the two players above you to overbet. Calculate the leader’s optimum cover wager over second place, and then subtract it from their score. Do the same for second place’s optimum cover wager over you. If either total is between your current score and twice your score, you need to both get Final Jeopardy! correct as well as make a significant wager to win the game. The specific game situation will dictate the size of this wager. If both totals are less than your current score, then your bet generally needs to make sure that your score stays above theirs if you’re all wrong. The specific game situation will again dictate the size of this wager. If you’re close enough that you can make a bet that both passes the leader’s pre-Final Jeopardy! total and stays above their scores if you’re all wrong on Final, you should do so. You might still be in contention for second place. Figure out what second’s place’s optimal cover bet is over you, subtract it from their score, and make a bet that ensure you finish above it. If your score is greater than 50% of the two leaders, you should bet to pass their pre-Final Jeopardy! score by at least $1. Daily Doubles found on the last clue of Double Jeopardy! can be very crucial, as they give you an opportunity to shape the scores going into Final Jeopardy! to your advantage. Many times a “perfect” wager increases your opportunity to win regardless of whether you are correct or not on the Daily Double. So, there you have it! Hopefully this provides you with the information you need for Final Jeopardy! betting on the show! Good luck! If you have any feedback regarding this guide, the author’s contact information can be found here.